Thomas Greene Wiggins, who is profiled at AfriClassical.com was born on the Wiley Edward Jones plantation in Harris County, Georgia on May 25, 1849. He came into the world blind and autistic but a musical genius with a phenomenal memory. 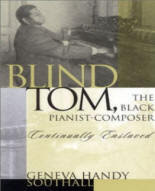 The primary source of this essay is “Blind Tom, The Black Pianist-Composer: Continually Enslaved”, written by Geneva Handy Southall and published by Scarecrow Press (2002). In 1850 Tom, his parents and two brothers were sold to James Neil Bethune, a lawyer and newspaper editor in Columbus, Georgia. Young Tom was fascinated by music and other sounds, and could pick out tunes on the piano by the age of four. He made his concert debut at eight, performing in Columbus and Atlanta, among other locations. In 1858 Tom was hired out for five years to Oliver Perry as a slave-musician, at a price of $15,000. Southall writes that by 1861 Tom was giving prestigious performances. She adds: “He was also a published composer by this time, his 'Oliver Galop' and 'Virginia Polka' having been published by the prestigious Oliver Ditson publishing firm in 1860.” By October, 1862 Tom was back with his owner, and had a lucrative and busy schedule of performances to raise money for Confederate relief. His repertoire included his own composition, “Battle of Manassas”. He could also play “Dixie” with one hand and “Yankee Doodle” with the other, while singing “The Girl I Left Behind Me”. James Bethune protected himself against the possibility of a Union victory in the Civil War by convincing Mingo and Charity Wiggins to sign an indenture agreement for Tom's services, on May 30, 1864, for a period of five years. Money was promised to both parents and son. The first legal challenge to the indenture was filed in July, 1865 by a Black business man named Tabbs Gross, but a Cincinnati court ruled in favor of Bethune. By the age of 16, Prof. Southall says, Tom could play difficult works of Bach, Chopin, Liszt, Beethoven and Thalberg. He also played pieces after one hearing, and memorized poems and text in foreign languages. His rich baritone voice was displayed in songs written by himself and others. Promotional material regularly claimed that Tom was untaught; in fact he traveled with a high-paid tutor who was a Professor of Music. The Bethunes used a European tour to obtain testimonials from prominent classical composers, including Ignaz Moscheles and Charles Halle, which they printed in a booklet, “The Marvelous Musical Prodigy Blind Tom”. By 1868 the Bethunes were living on a Warrenton, Virginia farm where Wiggins spent his Summers, between concert tours of the U.S. and Canada. John G. Bethune was his manager and legal guardian. The Bethunes were taking in $50,000 per year from Tom's concerts, while Tom and his impoverished parents received virtually nothing. John Bethune was killed in 1884; his father was appointed Tom's guardian. Eliza Bethune, John's ex-wife, joined Tom's mother Charity Wiggins in a Federal Court suit, and in 1887 won custody. Eliza then married her successful attorney, and the two oversaw an even more exhausting schedule of performances by Wiggins. The pianist John Davis recorded the first commercial CD of music composed by Thomas Wiggins, “John Davis Plays Blind Tom”, Newport Classic 85660 (1999). He writes in the liner notes: “Eventually, Blind Tom's repertoire grew to an astounding seven thousand established works, including those of Bach, Beethoven, Chopin, Mendelssohn, and Liszt, not to mention over a hundred composed by himself.” Tom last performed in 1905, Prof. Southall writes. Tom died of “cerebral apoplexy” at age 59 on June 13, 1908 at the home of Eliza Bethune Lerche in Hoboken, New Jersey. Lengthy obituaries appeared in newspapers around the country, but it was the Black newspapers that stressed that Thomas Wiggins, a marvelously gifted pianist and composer, was exploited all his life. Slave owners and managers lived luxuriously while Tom's impoverished mother was denied both his earnings and his companionship.